Heroines of Avalon weaves the ancient stories of British Isles goddesses and heroines together in a feminine, melodic assembly. 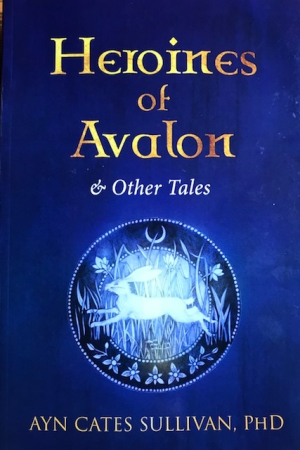 Ayn Cates Sullivan’s Heroines of Avalon and Other Tales is a beautiful mythology collection focused on the goddesses and heroines of the British Isles, sharing their stories and imagining how they can be honored in contemporary lives. The collection is divided into three sections—one on Welsh mythology, one on British mythology, and one on the myths of the women of Avalon. Each section is subdivided to cover goddesses and heroines individually—first giving background information on each woman’s place within the myths, including their cultural and religious significance and individual abilities, then presenting their stories, and then proposing how they can be honored today. The format is easy to navigate, and all of the information is easy to process. Sullivan’s retelling explores how the women’s actions led to their growing into legends. The women covered include the Welsh “archetypal womb Goddess” Arianrhod, who is betrayed and tricked into motherhood, and the Arthurian heroine Elaine, who guarded the Holy Grail with her life but was reduced to a lesser role within King Arthur’s story. Stories and sketches capture the period details well, from clothing to weapons to royal courts. These are stories that have been told before, but Sullivan makes them her own. Her writing is lyrical and focuses on making the women central within familiar stories. Its tone is reverent, and its details are magical, from Blodeuwedd’s transformation from a flower into a woman to Iouga’s spiritual connection to her river. Here, the fantastical is not shied away from—it is amplified. The reading experience is thorough and provocative. While some of these women interact in the myths, their stories are incorporated in a way that makes linear reading unnecessary. Goddesses can be approached on an individual basis, according to their attributes and abilities or to reader interest. Instructions on connecting with each goddess are included—such as channeling Blodeuwedd, who is made a patron of physical love, within relationships; or calling upon Elen, who protects travelers, when you’re on a journey—elevating the book beyond its educational aspects and encouraging reflection and interaction. Each heroine is different, both in meaning and in personality, and their stories are differently told. Each story has a distinct tone that complements the personality of its character, enabling deeper connections to the goddesses and heroines. At first, legends are related from a third-person point of view; halfway through, the text switches to a first-person narrative.